INDICATIONS AS AT 24 FEBRUARY 2004: KEFLEX is indicated in the treatment of the following infections when caused by susceptible strains of the designated microorganisms: Respiratory tract infections caused by S. pneumoniae and group A beta-haemolytic streptococci (Penicillin is the usual drug of choice in the treatment and prevention of streptococcal infections, including the prophylaxis of rheumatic fever. KEFLEX is generally effective in the eradication of streptococci from nasopharynx; however, substantial data establishing the efficacy of KEFLEX in the subsequent prevention of rheumatic fever are not available at present.) Bacterial sinusitis caused by streptococci, S. pneumoniae and S. aureus (methicillin-sensitive only) Otitis media due to S. pneumoniae, staphylococci; Skin and soft tissue infections caused by staphlococci anr/or streptococci; Genitourinary tract infections, including acute prostatic caused by E. coli, P. mirabilis, and Klebsiella sp. The effectiveness of KEFLEX in the treatment of bacterial infections of the brain and spinal column has not been established and KEFLEX is not indicated in these conditions. NOTE: Appropriate culture and susceptibility test should be initiated prior to and during therapy to determine susceptibility of the causative organism to KEFLEX. Renal function studies should be performed when indicated. A white free-flowing powder before reconstitution and a red suspension after reconstitution. 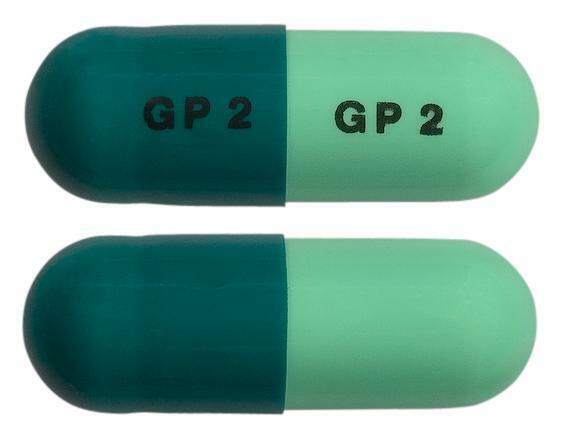 An opaque dark green and opaque light green capsule, size 0 marked with "GP2" on the cap and body. 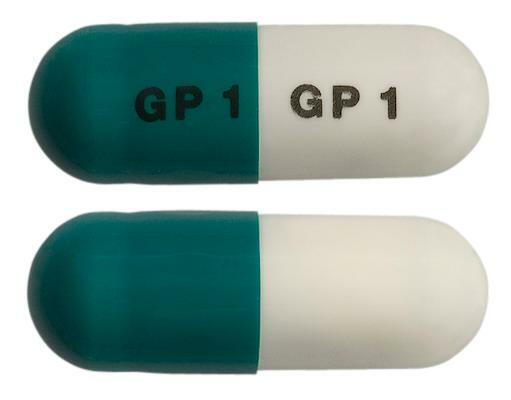 An opaque dark green and white capsule, size 1 marked with "GP1" on the cap and body.